Natural Designer Homes constructs high quality award-winning projects that achieve sustainability and harmony within the built environment. They work with clients from their project’s concept through to its completion, and have the necessary skills and knowledge to deliver with the very best sustainable outcome. Mick started his career in the building industry as a carpenter, and has worked on high-end projects from the very beginning. He originally struck out on his own by forming Mick Corcoran Building, which quickly earned a reputation for delivering high quality luxury homes for satisfied clients. Recently, he formed Natural Designer Homes as an offshoot of that, to cater to clients that want to live a more sustainable lifestyle. Today, Natural Designer Homes works in New South Wales, as far north as Gold Coast & Tweed Heads and as far south as Byron Bay, Lennox Head & Ballina. They also extend out west to smaller villages such as Mullumbimby & Murwillumbah. Their projects range in value from $400,000 and up, with no limit from there. 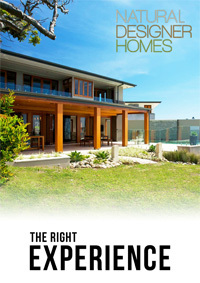 In that high-end bracket, clients choose Natural Designer Homes for their superior building knowledge. Before staring Natural Designer Homes, Mick ran a successful architectural building company for many years. Before that, he personally obtained an Advanced Diploma in Building & Construction – which is the highest level of training a builder can undertake. He also regularly works with the MBA and HIA as a lecturer, teaching up-and-coming builders how to interpret and understand technical aspects of building. Mick’s superior knowledge also extends to sustainable building – which he has been personally interested in all his life. Mick has earned a strong industry reputation for his knowledge. As a result, many of his clients approach him, and usually before they’ve settled on a design. This is the way he prefers it. Natural Designer Homes’ extraordinary dedication to quality and sustainability has not gone unrewarded the industry, or by clients. From the start, the vast majority of the company’s work has been received from recommendations and referrals – the very best indicator that customers are satisfied with the support offered both during after the building process. 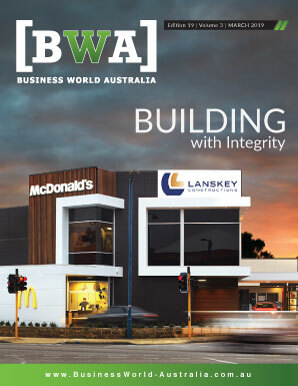 The company’s hard work has also been repeatedly recognised by the HIA and MBA Awards. Between the two bodies, Mick Corcoran Building and Natural Designer Homes has been a winner or finalist in more than 40 categories since in four years. 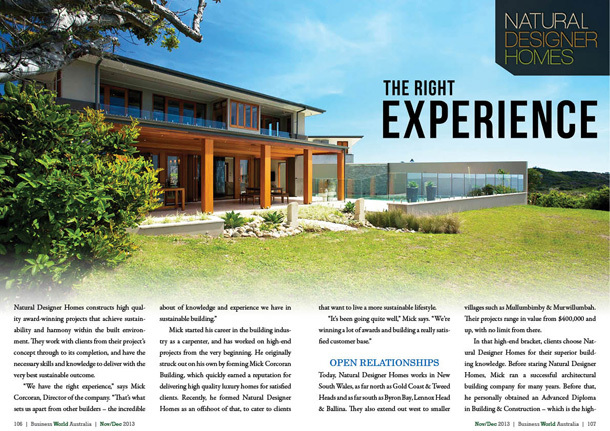 Most recently, at the 2013 Master Builders NSW Excellence in Building Awards, Natural Designer Homes took home two prestigious accolades – for Best Environmental Management (Open Category), and Best Sustainable Energy Project. Mick credits the company’s award-winning record to the consistency of their quality. He says they’re always doing as good a job as they possibly can, and are always learning to do things better. He also says he’d rather drop his profit margin than his standards. He also credits the awards success to the talent and dedication of the company’s subcontractors. They try to work with the same people on every project, and they have developed a team that consistently delivers strong results. When it comes to their most recent award win, for Best Sustainable Energy Project, Mick says Natural Designer Homes has been successful because of their “little touches,” like the sustainable attributes of their windows and doors, their formaldehyde-free plywood joinery, or the clay in the walls. Moving forward, Mick says his goal is to continue bringing that high level of sustainability to the market – and to continue satisfying customers while doing it. He sees Natural Designer Homes growing slowly, but while maintaining their personalised service, and maintaining the consistency of their quality.